The mile-long section of track that ran along the east bank of the San Lorenzo River between Ben Lomond and Brookdale hosted two stations that both catered to private residences and appeared around the same time. At the northern end of this stretch, just before the Southern Pacific Railroad's Boulder Creek Branch crossed back over to the west bank of the river, Siesta Station was established beside the property of Fred Wilder Swanton. Siesta was an appropriate name that both described the purpose of the location—it was a "rest" stop for Swanton in the Santa Cruz Mountains—and matched the Spanish Revival atmosphere that was gripping California at the time. Indeed, Swanton named his massive new hotel on the Santa Cruz Main Beach the Casa del Rey and built it in just such a style. The Swanton Cottage, though, which sat between the tracks and the river, was no adobé-style mansion. Instead, it was a very simple redwood lumber and log bungalow that matched a slightly older, rugged aesthetic. Swanton had purchased the property in 1908 on land that had originally been John W. Ellsworth's lumber mill decades earlier. It had been logged out early so most of the nearby redwood trees were second growth, leaving plenty of room to build a cabin. Despite its rural location and simple style, it was designed by none other than William Henry Weeks, a famed architect who had built several impressive structures across California including the Boardwalk's Casino and Plunge and the hotel across from them. Weeks and his crew finished the building by the summer of 1910 and Swanton named it "La Siesta." The swimming hole below Siesta, probably taken from atop the railroad bridge, c. 1915. La Siesta was a short-lived thriving private resort. It included a dance pavilion beside the river, electrical lighting, an expansive garden with fountains, and indoor plumbing. Down at the river, Swanton installed a seasonal dam to allow swimming and boating beneath the railroad bridge there. He also experimented with an aerial tramway to transport goods across the river from the county road (State Route 9), aided in the construction of this by W. D. Dalton, his son-in-law. Near the end of 1910, Swanton also brought in a dozen excess cottages that had to be removed in Santa Cruz to make way for the Casa del Rey Hotel. These became the core component of his summer resort. Friends from across the country came to visit and stay the summer south of Brookdale, using the train to get there. Swanton had always had a close relationship with the Southern Pacific Railroad. When he began operating the Bay Shore Limited Railway at the Boardwalk in 1907, he gave special tickets to Southern Pacific staff and was granted, in exchange, free rides on their network. 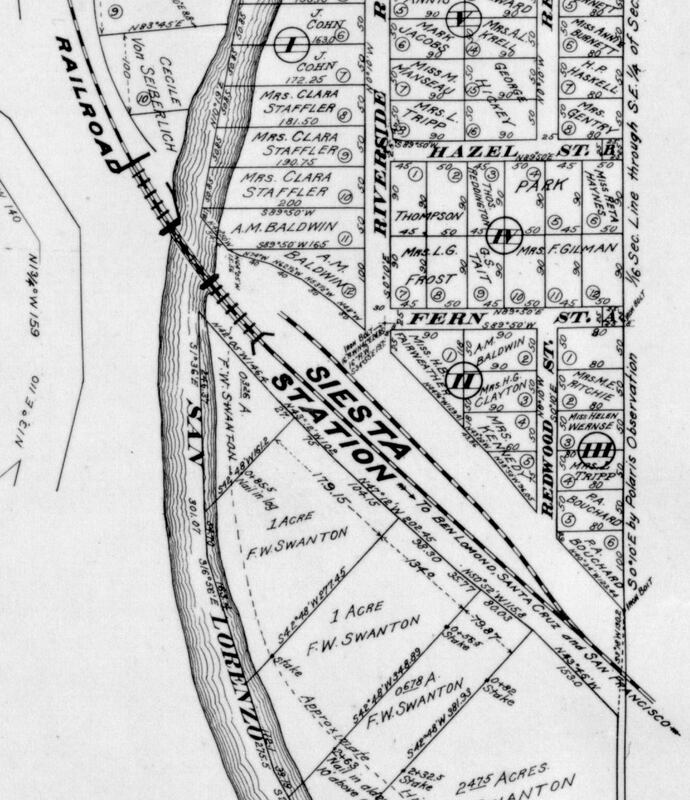 Almost as soon as Swanton began construction of La Siesta, the railroad allowed for a stop to be established there. At first, it was probably to transport construction material and cottages since Swanton had no road access initially. But in later years, it was certainly for passenger use. A 1,076-foot siding was built on the east side of the tracks upon which excursion trains could park. To support this stop, Swanton built an ornate station shelter with stained-glass windows that sat between the branch line and the spur. Swanton's financial investments suffered in the mid- to late-1910s and he was forced to sell his home in 1920. The cottage passed to several owners over subsequent years, but remains largely unchanged in its style. The area across from the Swanton Cottage was subdivided at the same time that Swanton purchased his property and it remains a thriving subdivision today. At some point, probably in the late 1910s, a bridge was built across the river along Larkspur Street to provide direct automobile access. Siesta remained on railroad timetables until the closure of the line in January 1934, but it is unclear if passengers continued to use the stop. Presumably the owners of the cottage and neighbors to the south periodically called passing trains until passenger service ended in 1930. The site of Siesta is now a private driveway just beyond the end of Riverside Road in Brookdale. The right-of-way is entirely intact here with a concrete bridge pier visible to the north and a fence to the south. The Swanton Cottage remains only partially changed across from the stop. The old station shelter was converted into an ornate treehouse and sits behind the cottage atop a large stump. It still retains original stained-glass windows and the look of a 1910s-era building. Trespassing on any of this property, including the right-of-way, is not permitted. However, the home has been up for sale for several months now and may potentially be viewed via Micki Dahl at Century 21. The building has been given a Santa Cruz Museum of Art & History blue plaque award in recognition of its age, architectural style, and history. The right-of-way at Swanton, looking north, clearly showing enough width for the mainline and a spur, 2013. Clark, Donald Thomas, Santa Cruz County Place Names: A Geographic Dictionary (Scotts Valley, CA: Kestrel Press, 2008). Whaley, Derek R. Santa Cruz Trains: Railroads of the Santa Cruz Mountains. Santa Cruz, CA, 2015. Craig here. Wow, another fantastic post! The bridge piers are definitely still there - I was able to scale them years ago with some climbing gear. 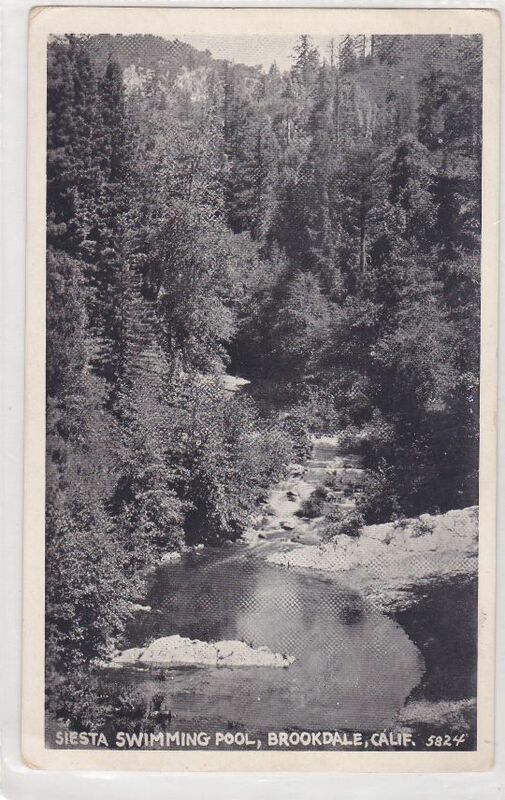 I also remember finding that swimming area from the postcard south of the Larkspur bridge when roaming along the river as a kid. it sounds like the appearance of Siesta coincides pretty closely with the creation of Brookdale itself right around 1910 or so. I know Brookdale was a planned vacation community - I wonder if Siesta was a similar kind of place, maybe even with different owner/developers? The spur is a bit of a head-scratcher, as I was under the impression (quite probably wrong) that logging was mostly done by then, and that Brookdale (and I would assume nearby Siesta) were well into their lives as vacation destinations. Weren't there some spurs that were vacation-oriented, like up near Wrights (where stops were made by picnickers and cars left on a siding for the day)... is that a possibility? BTW, you used to be able to clearly see the bridge piers by parking near Larkspur, then walking back along Hwy 9, looking down the very steep hillside towards the river from the very narrow path behind the guardrail. I used to look for them from the school bus. Don't know what the view is like today. Good news all around. And I'm glad I properly identified the swimming area as it was a bit of a guess based on the river's course. I don't think Siesta had much at all to do with Brookdale's development, though. Numerous subdivisions were being created in the county in the 1900s and 1910s so I assume this was just another one. Some wealthy railroad tourist probably just noticed the large clearing beside the tracks at Siesta and thought it would be a good place to build some homes. I could be wrong, of course, and there could have been an actual little tourist village there. Much of the mountains were populated by seasonal residents who either eventually stayed or sold their homes to people who did. I rather feel this may be the case with Siesta. The spur probably was not a picnic line, though. The Southern Pacific mostly went away with that prior to the earthquake because the picnic spots would become places of drunkenness and become quite littered. I suspect the "spur" here may have just been a dead-ended freight siding that was perhaps used to queue some local fruits and vegetables. You are correct that most of the logging in the area was done by the 1920s, but some people still had small private operations, so it is not entirely impossible. Still, it was likely for a local business rather than logging. I'm hoping to stop by the Siesta subdivision in just an hour or so to check the place out. I'll check the condition of the right-of-way and see if I can find the bridge piers. I figured that Siesta mostly was tied to Brookdale via the timing of the developed communities there, as opposed to an actual joint land development... the timing due to the waning of lumbering and the growing awareness of money to be made by selling former lumbering lands as vacation plots. The gold rush towns in the Sierras have a similar history to the Valley towns, where once the lucrative industry that spurred development has left (here is was mining), the company-oriented settlements underwent a transformation into rural towns and communities... and more the case in the Valley, vacation destinations. Even when I was growing up in Brookdale in the 70's, the majority of the houses were empty most of the time, being owned by out-of-towners and used only for a few weeks or months out of the year. Our house on Larkspur, built in 1928, had a sink and medicine cabinet in each bedroom, such was the 'vacation' nature of the area. It even had two light weight sections of what looked like narrow gauge rail for the fire dogs in the fireplace (sadly, the current owner tells me those are gone now). Of the houses surrounding us that I can think of, 4 houses were occupied by permanent residents (a realtor, and retired old man, a retired couple, and some hippies-types), and 4 were usually empty with drawn curtains most of the year... always gloomy and dark places in the winter months. The hills were filled with small 1 and 2 room cabins. the San Lorenzo River near this road's southern end. Went to Siesta today and took a few photos of the bridge piers, though they are at bad angles. I knew about the Irwin Way ones but I still need to check them out soon. I was disappointed to see that River Road is a gated private road beyond Siesta, so I can't follow the right-of-way in that area at all. at Siesta are hard to see or photograph. never seen these piers from this angle nor the right of way you photographed! I DO wonder what is left of that SECOND crossing of the San Lorenzo River going north. Arrrgh! It's gone. There was an old house/bungalow that would have been facing you as you snapped those photos, and I'm saying only a few feet. It was on the southwest side of the tracks, oriented with the tracks, and with its front door and front yard opening up to the tracks. I've always wondered about it because of the placement. My grandfather built a summer house on Redwood Street, two lots above Hazel, in 1963. From '63 to '71 I spent many afternoons sitting on the foot of that (eastern) pier or on the beach by the "swimming pool". While I never remember seeing who lived in that building or even remember a car parked nearby, it was always kept-up, had planted shrubs around, and felt lived-in. It just had to have been linked to the railway in some way, and yet it seemed too relaxed to have been repurposed. I think it was still there when I revisited the area in 1982. At this point I believe Fred W. Swanton equals Siesta Flag-stop, as the 1909 map shows this structure to be on his property. I don't know the years that he remained an active businessman - but if he can help build the Boardwalk, why not Siesta? Was he active in 1900-13? Also, your photo that aims north, there was a lot of dirt bulldozed into that spot. The ground sloped away, the roadbed provided a cleaner and higher path to a wooden retaining wall (thus begins the bridge) from which we jumped (not quite four feet). The roadbed was single track with blue granite ballast; I never bothered looking for a very separate spur. The roadbed leading south became lost in the tall weeds, we're talking 1967, and no sign of an orchard either. Your southward photo looks just like I remember it. Okay, I think I've answered my own curiosity. 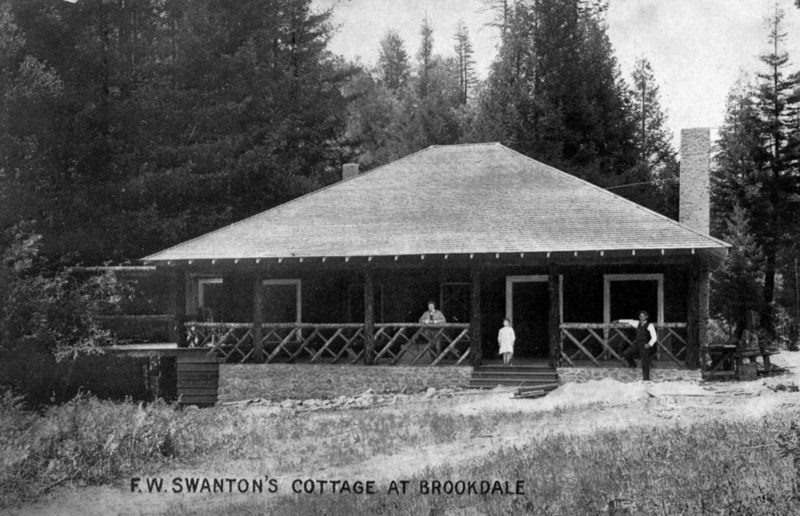 The Swanton Cottage of Brookdale seems about right. I googled and found an image at the top, the one with the child in the doorway, and it is about what I remember. It looks like it pre-dates the rails by a few years (built 1880), and almost looks like something oddly out of the Civil War era. I wonder if it was on some registry where it only received periodical upkeep for years, with Brookdale eventually deciding to move it. I'd like to see more pictures and find out its fate. Fred W. Swanton is also responsible for the dam on the river. I'm guessing they mean the wall with spillway that is just above the "swimming pool". Look at the postcard, the highest whitewater is the spillway, the faint line to the sides is the dam, and the quiet water above is the result. Nice observations. Thanks for the research. I know of the Swanton Cottage, but you are stating that the cottage was originally beside the tracks at Siesta? If so, that's very interesting to hear! If Swanton built the cottage, though, it shouldn't pre-date the tracks. He lived in Santa Cruz from the late 1880s through until his death in 1940. He was a major entrepreneur and mayor of Santa Cruz twice in the 1920s and 1930s. His home is almost certainly on the National Registry of Historical Places, though I've never checked. Good to know about the dam, too, though can I get a link or reference for the source? I totally see what you're talking about in the photo and that was fairly common along the San Lorenzo River. For the dam, I only searched 'Fred W. Swanton Brookdale' and it was the third item down. The Santa Cruz Library has microfilm available for the Mountain Echo, May 7, 1910 "Dam in River Below Brookdale for Bathing". I had to use my best guess about which was the actual structure; I'm doing a lot of guessing and hoping it doesn't foul the record. Craig again: I also remember the old concrete dam right about where Grant mentions it. That section of the river is where I spent the majority of my time, and the remains of the dam were a place where my brothers and I always expected to find fish (due to the water that still remained behind the spillway) but strangely never seemed to find any. We always referred to it as the old fish hatchery, though I'm sure that was a very loose attribution to the hatchery on Larkspur & may have had nothing to with the hatchery at all. Swanton's Cottage was built in 1910 and was called "La Siesta." Like I said in my comments above, I'd really like to know what house stood along the tracks and continued to exist until recent times. Its location would have been in the middle of Riverside Road if it had continued past Fern Street and on down the slope. Few structures exist that illuminate past patterns of living quite like this forgotten house; and if I were to tour the area I might ask anyone if they knew of its fate. If it was the Swanton Cottage, I would hope that more information could be collected. The one photo that is available now, does not extend far enough to the right to see anything that could help us place it. Fred Swanton was an interesting man, part developer and part environmentalist; I'd like to understand what his intentions were with all of that property. Siesta was built by and for Fred Swanton. His cottage still sits on the river side of the r.o.w. in this area and the r.o.w. continues into the woods a little bit before running into another person's property. It then continues south down River Road. Swanton used the property to entertain guests who were visiting him from out of town. The SLV Museum has two almost identical photographs of the railroaders at a picnic at Swanton. The angle is a bit difficult to determine but the small station house may be in the background. Swanton also kept a spur there, probably to park private coaches on when wealthy friends were visiting from out of town. I don't think he really had an intention for the property other than a seasonal cottage to entertain guests at. The properties above the tracks in the 1909 survey map have a nice straight line to them. I think that the original narrow-gauge line may have taken a slightly different angle that put it closer to these properties, and then swung a left turn to cross the river on a shorter, more perpendicular and possibly taller trestle. This would put the tracks much closer to the corner of Fern and Riverside; and with the number of homes already built, I would expect passengers to have gathered and flagged the train at that site with or without a station. I think that a shelter and maybe a freight platform would have been built, and that the standard-gauge spur was used as a link to those original structures. Boulder Creek branch right of way, trespassing is hard to avoid.